There are Cowboy Bebop Movie Blu-rays all over the place now, but when I was in the mood to add it to my collection, not long after the UK release of the original series in HD, there were just two ways to get it in an English territory. The Region A locked release from Image in the US was a barebones release but it had lossless stereo audio. For the surround audio, you had to go for the Australian release from Umbrella Entertainment, which ported all the extras from the DVD, but left the audio as lossy Dolby Digital. 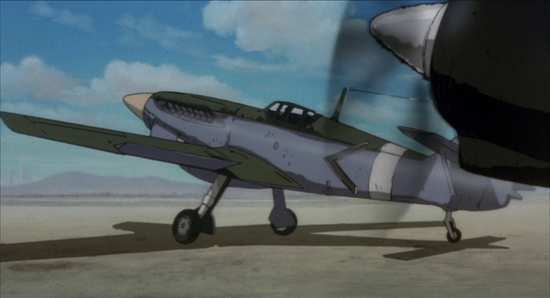 That’s the version I imported in the end, but since then, Manga Entertainment have released that same version in the UK, and it is also now part of Anime Limited’s Ultimate Edition release of the show as well. And in the US, Funimation have released a version of the film which has lossless surround audio, and it has the extra features too, but apparently they’ve done their usual post-processing to the video and by some reports made it worse. 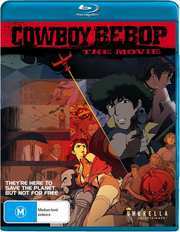 After all that, I am now getting round to watching my copy of Cowboy Bebop The Movie, imported from Australia. Mere days before Halloween 2071, a tanker explodes on a Martian highway, spraying onlookers with a deadly virus. The authorities fear another more horrific attack, and post a bounty for the terrorists behind the tanker explosion. 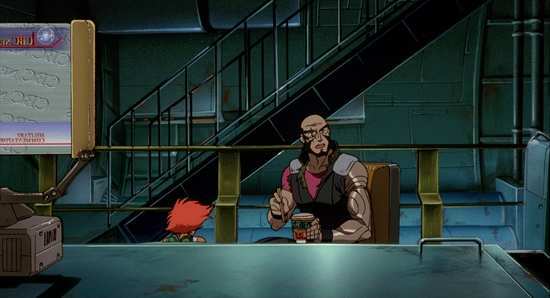 This is good news for the crew of the Bebop, whose funds are so low that they have been reduced to eating Pot Noodles. This time however, they may be in over their heads, as clues lead to a military conspiracy, illegal research and an adversary that apparently died years ago, and is reluctant to do so again. 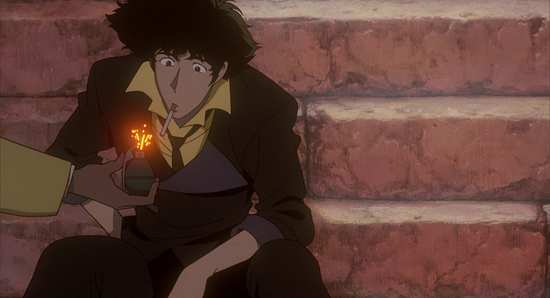 Cowboy Bebop the Movie is presented with a 1.85:1 widescreen 1080p transfer. This looks to share the same source as the original DVD release, and as such, while it looks pretty impressive in HD, with consistent colours, and strong detail, as well as smooth progressive animation, you do wind up wishing the film had got a new scan at 4k resolution instead. This is after all one of the last anime that was created with cel and paint, rather than exclusively on computer. 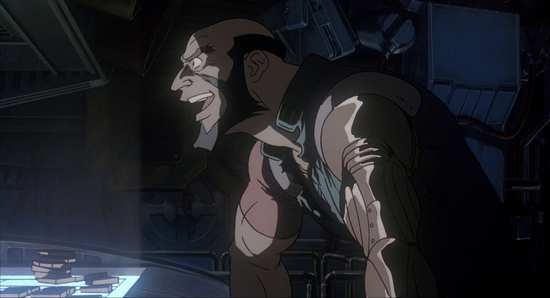 Where the film really impresses is with the character animation, which is realistic and wonderfully detailed. When Spike unleashes some jeet kun do moves, you can really feel the impact. You have the choice between Dolby Digital 5.1 Surround Japanese and English with optional translated subtitles. The audio is at DVD fidelity, 448kbps, but the sound is actually an improvement over the SD format. It seems as if it has been remixed and has a better balance between dialogue, music and effects. The DVD favoured the music a little too much. The surround is good enough to immerse you in this future world, and convey the action. 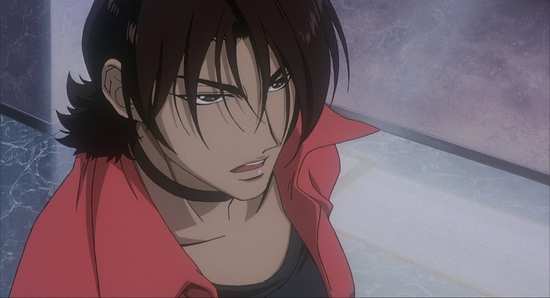 The subtitles are lifted from the DVD (Ed is still called Edo), and they could have used a thicker black border, as they tend to get lost against brighter backgrounds. You get one disc in a BD Amaray, and it has a reversible sleeve if you don’t like that Australian ratings logo on the front. The disc boots to an animated menu and one immediate flaw is that you can’t set the audio options from the menus. The disc defaults to Japanese with no subtitles and you’ll have to use your player remote to select the options you want. There are six featurettes on this disc. From The Small Screen To The Big Screen lasts 5:44.
International Appeal: What’s Not To Like? lasts 7:02. There are Storyboard Comparisons, four in all, and they are just as you would expect. The total running time for the four scenes is 15:14. 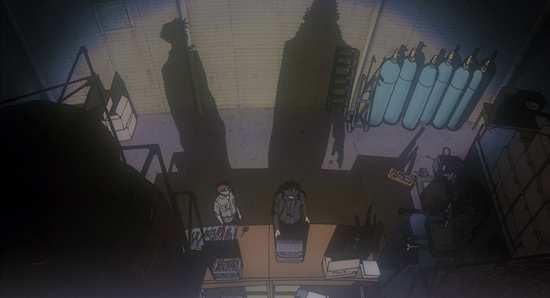 There are Conceptual Art galleries for the characters, machines and accessories in the Bebop universe. There are 112 line drawings in total spread around five categories. The Theatrical Trailer lasts 2:05, and all the extra feature video content is in SD. What didn’t get transferred over from the DVD are the textless credits, and the text biographies for the characters. 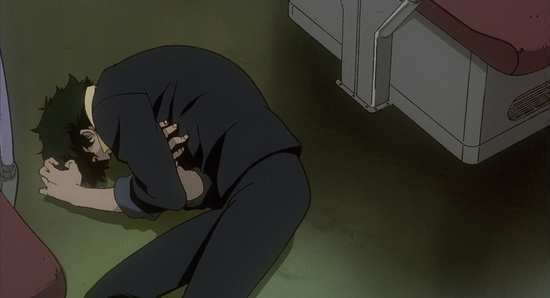 Cowboy Bebop is a must see anime, it’s among the best feature animations that I have seen. It excels in nearly every aspect. It must be said that the story is unexceptional; it’s a classic cyberpunk thriller with just enough sci-fi to keep it futuristic. A city is held to ransom, by a mysterious figure with access to a horrific virus. This could be the stuff of many a spy thriller were it not for the Martian setting and the nature of the threat. What makes this story shine is the way that it is presented. There is a certain ambiguity about the villain that makes him slightly more ominous, and we aren’t given too many clues about his motivations. While the story is familiar and simple, its complexity lies in the way we learn what is going on. I’ve said this already, but the animation is superb. The characters flow with a smoothness and grace that looks astounding, and there is individuality in their movements too, that reflects their characters. Ed particularly has a spaced out feel to her movements that adds charm to her character. I’ve also already mentioned the fight sequences, but it bears repeating, they are that good. There is also a great amount of care and attention paid to the world design. I have rarely seen such a rounded world presented in an animation. I got the feeling that every aspect of the world had been thought about, and if I could peek around a corner, or pick up a newspaper in that world, it would be there, fully realised, even though it isn’t on screen. The music is also a cut above what I have come to expect from anime. 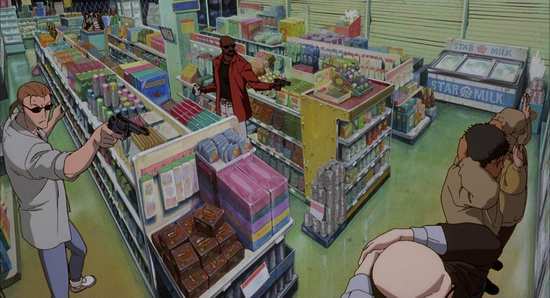 A combination of Blues Funk that reflects the Bebop of the title, Yôko Kanno’s music is an integral part of the world of Cowboy Bebop and is as much a character as anyone else. The tunes are toe-tappingly good, and enhance the action. Speaking of characters, the characters are designed well, but written even better. 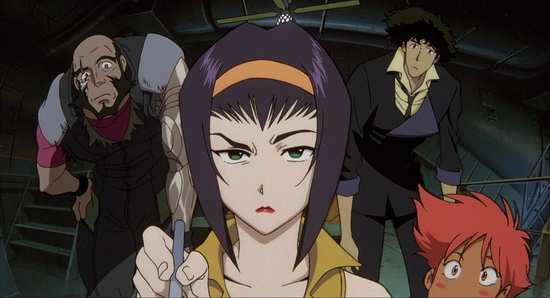 There is a depth to Spike, Ed, Jet and Faye that goes beyond the story. I suppose that is a reflection of the television series, but the interactions between them is a joy to watch. The same care has been applied to the other characters as well, and it all boils down to a film that just oozes cool. It’s cool on Blu-ray as well, and this Umbrella release is the one to get if you want surround audio, although by this time the Manga Entertainment release offers the exact same experience without the added fossil fuels burnt to get it over here. If lossless audio is your thing, then I’d say look up the Image Entertainment release alongside a Region A player. As for the most recent Funimation release, I’ve read plenty about it, and all of it bad. 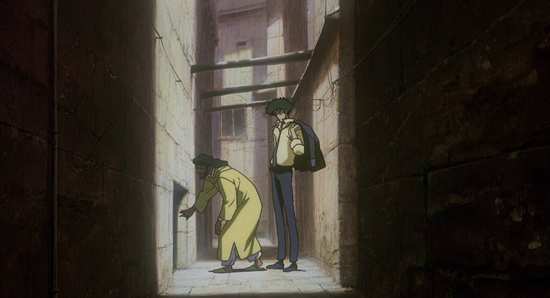 But really, Cowboy Bebop the Movie could use a new scan to give it the HD transfer it deserves.